All while reducing DUI related incidents. 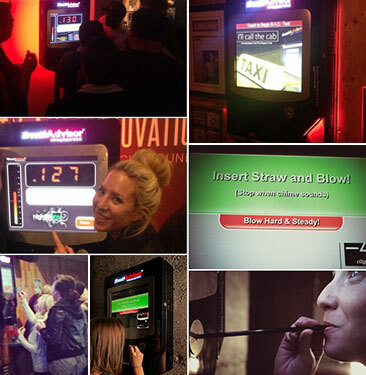 We've created the worlds most accurate breathalyzer kiosk on the market today with the sole purpose of giving a great user experience while helping your guests and staff make the right decisions at the end of the night. Ultimately, this reduces the likelyhood that someone will make the possibly fatal mistake of drinking and driving while at your establishment. Keep your guests and communities safe while increasing consumer loyalty by showing you care. Save staff time with cab requests. Protect your patrons and employees. 1. How accurate is the breathalyzer? We utilize the same DOT approved LifeLoc FC20 fuel cell breathalyzer that many law enforcement agencies use. This breathalyzer would cost individual consumers around $750 to purchase on their own. We're as accurate as you can get without drawing blood! 2. Are there any risks having a machine like this? While having a breathalyzer doesn't completely remove the inherent risks of operating a business that serves alcohol, it definitely doesn't expose you further. In the past, machines like this were marketed as a game for consumers and this presented an issue when it comes to over-consumption. We've taken extra measures to prevent this kind of behavior such as having a cap on how high patrons can blow. Before each use, every user must agree to an on screen disclaimer that explains the process of using a breathalyzer and what types of things can affect your results. We advise all patrons to never drive with any amount of alcohol in their system as it's the only sure way to prevent a DUI citation. 3. Will this decrease my alcohol sales? We have never heard of our product causing a decrease in alcohol sales for an establishment. It only discourages drinking for the right patrons. Is selling an extra drink worth a possible lawsuit? Most bar owners would agree that it's not. Our 19 inch screen is also a great way to encourage responsible consumption for the right consumers who have a DD or aren't planning on driving that night. 5. Are the readings anonymous? Yes the results are anonymous. We don't tie the results of the test to individual consumers. 6. How does the cab request work? 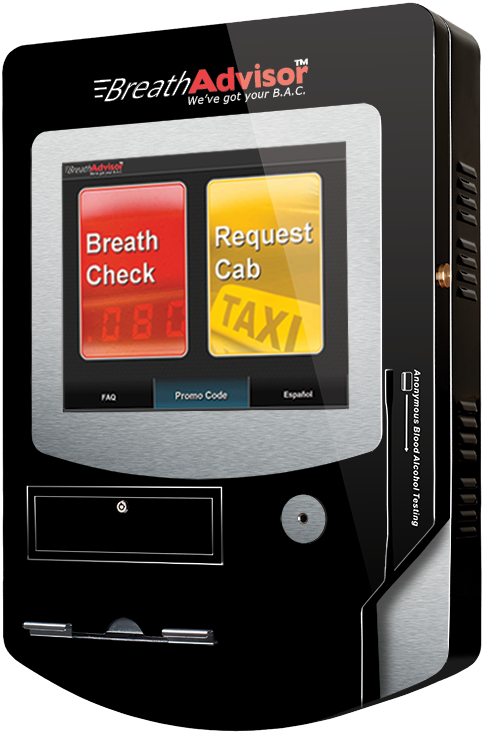 Patrons of your establishment can easily request a safe ride home directly from our machines by selecting the "Request Cab" functionality. They will be required to enter in a cell phone number and party size and then we send a text message to the consumer to confirm their request. That's it! Our patent-pending software utilizes a Voice Over IP service to call the taxi dispatch office in your area. The user will receive another text message once the ride has been confirmed. Other owners love this feature and say it has saved their bar staff a lot of time at the end of the night!